Teddy Bear With Heart is from the Steiff Classic range and is hand made in beautiful cinnamon and cream mohair and wears the famous trademark Button in Ear with Yellow ear tag. Airbrushing around eyes and on paws and holds a red felt heart with crystal button. This is held by some stitching. 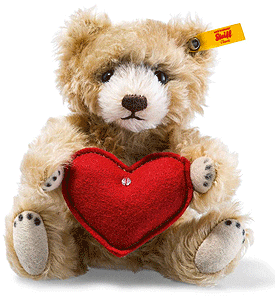 This 18 cm Teddy bear with heart is a wonderful reminder for special days and occasions. It is made of the finest mohair. The very natural appearance of the Teddy bear with heart comes from the cinnamon and beige highlights and the painted paws. Besides the use of the best materials that went into its making, this Teddy bear with heart can sit and stand beautifully since it has five joints and its head, arms and legs are moveable.A top highlight is the wonderful crystal from Swarovski on the heart.